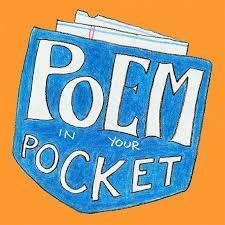 April is National Poetry Month and next Thursday, April 18th is Poem in Your Pocket Day! We are excited to announce we’ll be celebrating school-wide for the first time and encourage everyone to join in the fun. The idea is simple: pick a favorite short poem and share it with people all day. You can memorize and recite it, hand it out on little slips of paper, tape it to a parking meter, tuck it in a mailbox…the possibilities are endless!